"Circadian" redirects here. For the album, see Circadian (album). For the 2005 film, see Circadian Rhythm (film). A circadian rhythm (/sɜːrˈkeɪdiən/) is any biological process that displays an endogenous, entrainable oscillation of about 24 hours. These 24-hour rhythms are driven by a circadian clock, and they have been widely observed in plants, animals, fungi, and cyanobacteria. The term circadian comes from the Latin circa, meaning "around" (or "approximately"), and diēm, meaning "day". The formal study of biological temporal rhythms, such as daily, tidal, weekly, seasonal, and annual rhythms, is called chronobiology. Processes with 24-hour oscillations are more generally called diurnal rhythms; strictly speaking, they should not be called circadian rhythms unless their endogenous nature is confirmed. Although circadian rhythms are endogenous ("built-in", self-sustained), they are adjusted (entrained) to the local environment by external cues called zeitgebers (from German, "time giver"), which include light, temperature and redox cycles. In medical science, an abnormal circadian rhythm in humans is known as circadian rhythm disorder. In 2017, the Nobel Prize in Physiology or Medicine was awarded to Jeffrey C. Hall, Michael Rosbash and Michael W. Young "for their discoveries of molecular mechanisms controlling the circadian rhythm" in fruit flies. 7.3 Outside the "master clock"
The earliest recorded account of a circadian process dates from the 4th century BC, when Androsthenes, a ship captain serving under Alexander the Great, described diurnal leaf movements of the tamarind tree. The observation of a circadian or diurnal process in humans is mentioned in Chinese medical texts dated to around the 13th century, including the Noon and Midnight Manual and the Mnemonic Rhyme to Aid in the Selection of Acu-points According to the Diurnal Cycle, the Day of the Month and the Season of the Year. In 1896, Patrick and Gilbert observed that during a prolonged period of sleep deprivation, sleepiness increases and decreases with a period of approximately 24 hours. In 1918, J.S. Szymanski showed that animals are capable of maintaining 24-hour activity patterns in the absence of external cues such as light and changes in temperature. In the early 20th century, circadian rhythms were noticed in the rhythmic feeding times of bees. Extensive experiments were done by Auguste Forel, Ingeborg Beling, and Oskar Wahl to see whether this rhythm was due to an endogenous clock. The existence of circadian rhythm was independently discovered in the fruit fly Drosophila melanogaster in 1935 by two German zoologists, Hans Kalmus and Erwin Bünning. The term "circadian" was derived from circa (about) and dies (day); it may serve to imply that certain physiologic periods are close to 24 hours, if not exactly that length. Herein, "circadian" might be applied to all "24-hour" rhythms, whether or not their periods, individually or on the average, are different from 24 hours, longer or shorter, by a few minutes or hours. Circadian: relating to biologic variations or rhythms with a frequency of 1 cycle in 24 ± 4 h; circa (about, approximately) and dies (day or 24 h). Note: term describes rhythms with an about 24-h cycle length, whether they are frequency-synchronized with (acceptable) or are desynchronized or free-running from the local environmental time scale, with periods of slightly yet consistently different from 24-h.
Ron Konopka and Seymour Benzer identified the first clock mutant in Drosophila in 1971 and called it "period" (per) gene, the first discovered genetic determinant of behavioral rhythmicity. per gene was isolated in 1984 by two teams of researchers. Konopka, Jeffrey Hall, Michael Roshbash and their team showed that per locus is the centre of the circadian rhythm, and that loss of per stops circadian activity. At the same time, Michael W. Young's team reported similar effects of per, and that the gene covers 7.1-kilobase (kb) interval on the X chromosome and encodes a 4.5-kb poly(A)+ RNA. They went on to discover the key genes and neurones in Drosophila circadian system, for which Hall, Rosbash and Young received the Nobel Prize in Physiology or Medicine 2017. Joseph Takahashi discovered the first mammalian circadian clock mutation (clockΔ19) using mice in 1994. However, recent studies show that deletion of clock does not lead to a behavioral phenotype (the animals still have normal circadian rhythms), which questions its importance in rhythm generation. The rhythm has an endogenous free-running period that lasts approximately 24 hours. The rhythm persists in constant conditions, (i.e., constant darkness) with a period of about 24 hours. The period of the rhythm in constant conditions is called the free-running period and is denoted by the Greek letter τ (tau). The rationale for this criterion is to distinguish circadian rhythms from simple responses to daily external cues. A rhythm cannot be said to be endogenous unless it has been tested and persists in conditions without external periodic input. In diurnal animals (active during daylight hours), in general τ is slightly greater than 24 hours, whereas, in nocturnal animals (active at night), in general τ is shorter than 24 hours. The rhythms are entrainable. The rhythm can be reset by exposure to external stimuli (such as light and heat), a process called entrainment. The external stimulus used to entrain a rhythm is called the Zeitgeber, or "time giver". Travel across time zones illustrates the ability of the human biological clock to adjust to the local time; a person will usually experience jet lag before entrainment of their circadian clock has brought it into sync with local time. The rhythms exhibit temperature compensation. In other words, they maintain circadian periodicity over a range of physiological temperatures. Many organisms live at a broad range of temperatures, and differences in thermal energy will affect the kinetics of all molecular processes in their cell(s). In order to keep track of time, the organism's circadian clock must maintain roughly a 24-hour periodicity despite the changing kinetics, a property known as temperature compensation. The Q10 Temperature Coefficient is a measure of this compensating effect. If the Q10 coefficient remains approximately 1 as temperature increases, the rhythm is considered to be temperature-compensated. Circadian rhythms allow organisms to anticipate and prepare for precise and regular environmental changes. They thus enable organisms to better capitalize on environmental resources (e.g. light and food) compared to those that cannot predict such availability. It has therefore been suggested that circadian rhythms put organisms at a selective advantage in evolutionary terms. However, rhythmicity appears to be as important in regulating and coordinating internal metabolic processes, as in coordinating with the environment. This is suggested by the maintenance (heritability) of circadian rhythms in fruit flies after several hundred generations in constant laboratory conditions, as well as in creatures in constant darkness in the wild, and by the experimental elimination of behavioral, but not physiological, circadian rhythms in quail. What drove circadian rhythms to evolve has been an enigmatic question. Previous hypotheses emphasized that photosensitive proteins and circadian rhythms may have originated together in the earliest cells, with the purpose of protecting replicating DNA from high levels of damaging ultraviolet radiation during the daytime. As a result, replication was relegated to the dark. However, evidence for this is lacking, since the simplest organisms with a circadian rhythm, the cyanobacteria, do the opposite of this - they divide more in the daytime. Recent studies instead highlight the importance of co-evolution of redox proteins with circadian oscillators in all three domains of life following the Great Oxidation Event approximately 2.3 billion years ago. The current view is that circadian changes in environmental oxygen levels and the production of reactive oxygen species (ROS) in the presence of daylight are likely to have driven a need to evolve circadian rhythms to preempt, and therefore counteract, damaging redox reactions on a daily basis. The simplest known circadian clocks are bacterial circadian rhythms, exemplified by the prokaryote cyanobacteria. Recent research has demonstrated that the circadian clock of Synechococcus elongatus can be reconstituted in vitro with just the three proteins (KaiA, KaiB, KaiC) of their central oscillator. This clock has been shown to sustain a 22-hour rhythm over several days upon the addition of ATP. Previous explanations of the prokaryotic circadian timekeeper were dependent upon a DNA transcription/translation feedback mechanism. A defect in the human homologue of the Drosophila "period" gene was identified as a cause of the sleep disorder FASPS (Familial advanced sleep phase syndrome), underscoring the conserved nature of the molecular circadian clock through evolution. Many more genetic components of the biological clock are now known. Their interactions result in an interlocked feedback loop of gene products resulting in periodic fluctuations that the cells of the body interpret as a specific time of the day. It is now known that the molecular circadian clock can function within a single cell; i.e., it is cell-autonomous. This was shown by Gene Block in isolated mollusk BRNs. [clarification needed] At the same time, different cells may communicate with each other resulting in a synchronised output of electrical signaling. These may interface with endocrine glands of the brain to result in periodic release of hormones. The receptors for these hormones may be located far across the body and synchronise the peripheral clocks of various organs. Thus, the information of the time of the day as relayed by the eyes travels to the clock in the brain, and, through that, clocks in the rest of the body may be synchronised. This is how the timing of, for example, sleep/wake, body temperature, thirst, and appetite are coordinately controlled by the biological clock. Circadian rhythmicity is present in the sleeping and feeding patterns of animals, including human beings. There are also clear patterns of core body temperature, brain wave activity, hormone production, cell regeneration, and other biological activities. In addition, photoperiodism, the physiological reaction of organisms to the length of day or night, is vital to both plants and animals, and the circadian system plays a role in the measurement and interpretation of day length. Timely prediction of seasonal periods of weather conditions, food availability, or predator activity is crucial for survival of many species. Although not the only parameter, the changing length of the photoperiod ('daylength') is the most predictive environmental cue for the seasonal timing of physiology and behavior, most notably for timing of migration, hibernation, and reproduction. Mutations or deletions of clock gene in mice have demonstrated the importance of body clocks to ensure the proper timing of cellular/metabolic events; clock-mutant mice are hyperphagic and obese, and have altered glucose metabolism. In mice, deletion of the Rev-ErbA alpha clock gene facilitates diet-induced obesity and changes the balance between glucose and lipid utilization predisposing to diabetes. However, it is not clear whether there is a strong association between clock gene polymorphisms in humans and the susceptibility to develop the metabolic syndrome. Free-running organisms that normally have one or two consolidated sleep episodes will still have them when in an environment shielded from external cues, but the rhythm is not entrained to the 24-hour light–dark cycle in nature. The sleep–wake rhythm may, in these circumstances, become out of phase with other circadian or ultradian rhythms such as metabolic, hormonal, CNS electrical, or neurotransmitter rhythms. Norwegian researchers at the University of Tromsø have shown that some Arctic animals (ptarmigan, reindeer) show circadian rhythms only in the parts of the year that have daily sunrises and sunsets. In one study of reindeer, animals at 70 degrees North showed circadian rhythms in the autumn, winter and spring, but not in the summer. Reindeer on Svalbard at 78 degrees North showed such rhythms only in autumn and spring. The researchers suspect that other Arctic animals as well may not show circadian rhythms in the constant light of summer and the constant dark of winter. A 2006 study in northern Alaska found that day-living ground squirrels and nocturnal porcupines strictly maintain their circadian rhythms through 82 days and nights of sunshine. The researchers speculate that these two rodents notice that the apparent distance between the sun and the horizon is shortest once a day, and, thus, a sufficient signal to entrain (adjust) by. The navigation of the fall migration of the Eastern North American monarch butterfly (Danaus plexippus) to their overwintering grounds in central Mexico uses a time-compensated sun compass that depends upon a circadian clock in their antennae. Also, circadian rhythm is also known to control mating behavior in certain moth species such as Spodoptera littoralis, where females produce specific pheromone that attracts and resets the male circadian rhythm to induce mating at night. Plant circadian rhythms tell the plant what season it is and when to flower for the best chance of attracting pollinators. Behaviors showing rhythms include leaf movement, growth, germination, stomatal/gas exchange, enzyme activity, photosynthetic activity, and fragrance emission, among others. Circadian rhythms occur as a plant entrains to synchronize with the light cycle of its surrounding environment. These rhythms are endogenously generated and self-sustaining and are relatively constant over a range of ambient temperatures. Important features include two interacting transcription-translation feedback loops: proteins containing PAS domains, which facilitate protein-protein interactions; and several photoreceptors that fine-tune the clock to different light conditions. Anticipation of changes in the environment allows appropriate changes in a plant's physiological state, conferring an adaptive advantage. A better understanding of plant circadian rhythms has applications in agriculture, such as helping farmers stagger crop harvests to extend crop availability and securing against massive losses due to weather. Light is the signal by which plants synchronize their internal clocks to their environment and is sensed by a wide variety of photoreceptors. Red and blue light are absorbed through several phytochromes and cryptochromes. One phytochrome, phyA, is the main phytochrome in seedlings grown in the dark but rapidly degrades in light to produce Cry1. Phytochromes B–E are more stable with phyB, the main phytochrome in seedlings grown in the light. The cryptochrome (cry) gene is also a light-sensitive component of the circadian clock and is thought to be involved both as a photoreceptor and as part of the clock's endogenous pacemaker mechanism. Cryptochromes 1–2 (involved in blue–UVA) help to maintain the period length in the clock through a whole range of light conditions. The central oscillator generates a self-sustaining rhythm and is driven by two interacting feedback loops that are active at different times of day. The morning loop consists of CCA1 (Circadian and Clock-Associated 1) and LHY (Late Elongated Hypocotyl), which encode closely related MYB transcription factors that regulate circadian rhythms in Arabidopsis, as well as PRR 7 and 9 (Pseudo-Response Regulators.) The evening loop consists of GI (Gigantea) and ELF4, both involved in regulation of flowering time genes. 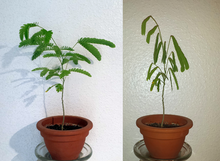 When CCA1 and LHY are overexpressed (under constant light or dark conditions), plants become arrhythmic, and mRNA signals reduce, contributing to a negative feedback loop. Gene expression of CCA1 and LHY oscillates and peaks in the early morning, whereas TOC1 gene expression oscillates and peaks in the early evening. While it was previously hypothesised that these three genes model a negative feedback loop in which over-expressed CCA1 and LHY repress TOC1 and over-expressed TOC1 is a positive regulator of CCA1 and LHY, it was shown in 2012 by Andrew Millar and others that TOC1 in fact serves as a repressor not only of CCA1, LHY, and PRR7 and 9 in the morning loop but also of GI and ELF4 in the evening loop. This finding and further computational modeling of TOC1 gene functions and interactions suggest a reframing of the plant circadian clock as a triple negative-component repressilator model rather than the positive/negative-element feedback loop characterizing the clock in mammals. In 2018, researchers found that the expression of PRR5 and TOC1 hnRNA nascent transcripts follows the same oscillatory pattern as processed mRNA transcripts rhythmically in A.thaliana.LNKs binds to the 5'region of PRR5 and TOC1 and interacts with RNAP II and other transcription factors.Moreover,RVE8-LNKs interaction enables a permissive histone-methylation pattern(H3K4me3) to be modified and the histone-modification itself parallels the oscillation of clock gene expression. Key centers of the mammalian and Drosophila brains (A) and the circadian system in Drosophila (B). The molecular mechanism of circadian rhythm and light perception are best understood in Drosophila. Clock genes are discovered from Drosophila, and they act together with the clock neurones. There are two unique rhythms, one during the process of hatching (called eclosion) from the pupa, and the other during mating. The clock neurones are located in distinct clusters in the central brain. The best-understood clock neurones are the large and small lateral ventral neurons (l-LNvs and s-LNvs) of the optic lobe. These neurones produce pigment dispersing factor (PDF), a neuropeptide that acts as a circadian neuromodulator between different clock neurones. Molecular interactions of clock genes and proteins during Drosophila circadian rhythm. Drosophila circadian rhythm is through a transcription-translation feedback loop. The core clock mechanism consists of two interdependent feedback loops, namely the PER/TIM loop and the CLK/CYC loop. The CLK/CYC loop occurs during the day and initiates the transcription of the per and tim genes. But their proteins levels remain low until dusk, because during daylight also activates the doubletime (dbt) gene. DBT protein causes phosphorylation and turnover of monomeric PER proteins. TIM is also phosphorylated by shaggy until sunset. After sunset, DBT disappears, so that PER molecules stably bind to TIM. PER/TIM dimer enters the nucleus several at night, and binds to CLK/CYC dimers. Bound PER completely stops the transcriptional activity of CLK and CYC. In the early morning, light activates the cry gene and its protein CRY causes the breakdown of TIM. Thus PER/TIM dimer dissociates, and the unbound PER becomes unstable. PER undergoes progressive phosphorylation and ultimately degradation. Absence of PER and TIM allows activation of clk and cyc genes. Thus, the clock is reset to start the next circadian cycle. A variation of an eskinogram illustrating the influence of light and darkness on circadian rhythms and related physiology and behaviour through the suprachiasmatic nucleus in humans. 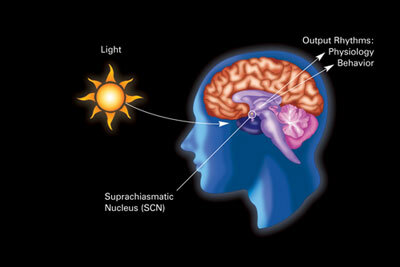 The primary circadian clock in mammals is located in the suprachiasmatic nucleus (or nuclei) (SCN), a pair of distinct groups of cells located in the hypothalamus. Destruction of the SCN results in the complete absence of a regular sleep–wake rhythm. The SCN receives information about illumination through the eyes. The retina of the eye contains "classical" photoreceptors ("rods" and "cones"), which are used for conventional vision. But the retina also contains specialized ganglion cells that are directly photosensitive, and project directly to the SCN, where they help in the entrainment (synchronization) of this master circadian clock. The SCN takes the information on the lengths of the day and night from the retina, interprets it, and passes it on to the pineal gland, a tiny structure shaped like a pine cone and located on the epithalamus. In response, the pineal secretes the hormone melatonin.Secretion of melatonin peaks at night and ebbs during the day and its presence provides information about night-length. The circadian rhythms of humans can be entrained to slightly shorter and longer periods than the Earth's 24 hours. Researchers at Harvard have shown that human subjects can at least be entrained to a 23.5-hour cycle and a 24.65-hour cycle (the latter being the natural solar day-night cycle on the planet Mars). Early research into circadian rhythms suggested that most people preferred a day closer to 25 hours when isolated from external stimuli like daylight and timekeeping. However, this research was faulty because it failed to shield the participants from artificial light. Although subjects were shielded from time cues (like clocks) and daylight, the researchers were not aware of the phase-delaying effects of indoor electric lights. [dubious – discuss] The subjects were allowed to turn on light when they were awake and to turn it off when they wanted to sleep. Electric light in the evening delayed their circadian phase. A more stringent study conducted in 1999 by Harvard University estimated the natural human rhythm to be closer to 24 hours and 11 minutes: much closer to the solar day. For temperature studies, subjects must remain awake but calm and semi-reclined in near darkness while their rectal temperatures are taken continuously. Though variation is great among normal chronotypes, the average human adult's temperature reaches its minimum at about 05:00 (5 a.m.), about two hours before habitual wake time. Baehr et al. found that, in young adults, the daily body temperature minimum occurred at about 04:00 (4 a.m.) for morning types but at about 06:00 (6 a.m.) for evening types. This minimum occurred at approximately the middle of the eight-hour sleep period for morning types, but closer to waking in evening types. Melatonin is absent from the system or undetectably low during daytime. Its onset in dim light, dim-light melatonin onset (DLMO), at roughly 21:00 (9 p.m.) can be measured in the blood or the saliva. Its major metabolite can also be measured in morning urine. Both DLMO and the midpoint (in time) of the presence of the hormone in the blood or saliva have been used as circadian markers. However, newer research indicates that the melatonin offset may be the more reliable marker. Benloucif et al. found that melatonin phase markers were more stable and more highly correlated with the timing of sleep than the core temperature minimum. They found that both sleep offset and melatonin offset are more strongly correlated with phase markers than the onset of sleep. In addition, the declining phase of the melatonin levels is more reliable and stable than the termination of melatonin synthesis. Other physiological changes that occur according to a circadian rhythm include heart rate and many cellular processes "including oxidative stress, cell metabolism, immune and inflammatory responses, epigenetic modification, hypoxia/hyperoxia response pathways, endoplasmic reticular stress, autophagy, and regulation of the stem cell environment." In a study of young men, it was found that the heart rate reaches its lowest average rate during sleep, and its highest average rate shortly after waking. In contradiction to previous studies, it has been found that there is no effect of body temperature on performance on psychological tests. This is likely due to evolutionary pressures for higher cognitive function compared to the other areas of function examined in previous studies. More-or-less independent circadian rhythms are found in many organs and cells in the body outside the suprachiasmatic nuclei (SCN), the "master clock". Indeed, neuroscientist Joseph Takahashi and colleagues stated in a 2013 article that "almost every cell in the body contains a circadian clock." For example, these clocks, called peripheral oscillators, have been found in the adrenal gland, oesophagus, lungs, liver, pancreas, spleen, thymus, and skin. There is also some evidence that the olfactory bulb and prostate may experience oscillations, at least when cultured. Though oscillators in the skin respond to light, a systemic influence has not been proven. In addition, many oscillators, such as liver cells, for example, have been shown to respond to inputs other than light, such as feeding. Studies by Nathaniel Kleitman in 1938 and by Derk-Jan Dijk and Charles Czeisler in the 1990s put human subjects on enforced 28-hour sleep–wake cycles, in constant dim light and with other time cues suppressed, for over a month. Because normal people cannot entrain to a 28-hour day in dim light if at all, this is referred to as a forced desynchrony protocol. Sleep and wake episodes are uncoupled from the endogenous circadian period of about 24.18 hours and researchers are allowed to assess the effects of circadian phase on aspects of sleep and wakefulness including sleep latency and other functions - both physiological, behavioral, and cognitive. A short nap during the day does not affect circadian rhythms. Timing of medical treatment in coordination with the body clock, chronotherapeutics, may significantly increase efficacy and reduce drug toxicity or adverse reactions. A number of studies have concluded that a short period of sleep during the day, a power-nap, does not have any measurable effect on normal circadian rhythms but can decrease stress and improve productivity. Health problems can result from a disturbance to the circadian rhythm. Circadian rhythms also play a part in the reticular activating system, which is crucial for maintaining a state of consciousness. A reversal[clarification needed] in the sleep–wake cycle may be a sign or complication of uremia, azotemia or acute renal failure. Lighting requirements for circadian regulation are not simply the same as those for vision; planning of indoor lighting in offices and institutions is beginning to take this into account. Animal studies on the effects of light in laboratory conditions have until recently considered light intensity (irradiance) but not color, which can be shown to "act as an essential regulator of biological timing in more natural settings". Obesity and diabetes are associated with lifestyle and genetic factors. Among those factors, disruption of the circadian clockwork and/or misalignment of the circadian timing system with the external environment (e.g., light–dark cycle) might play a role in the development of metabolic disorders. Shift work or chronic jet lag have profound consequences on circadian and metabolic events in the body. Animals that are forced to eat during their resting period show increased body mass and altered expression of clock and metabolic genes. [medical citation needed] In humans, shift work that favors irregular eating times is associated with altered insulin sensitivity and higher body mass. Shift work also leads to increased metabolic risks for cardio-metabolic syndrome, hypertension, and inflammation. Due to the work nature of airline pilots, who often cross several timezones and regions of sunlight and darkness in one day, and spend many hours awake both day and night, they are often unable to maintain sleep patterns that correspond to the natural human circadian rhythm; this situation can easily lead to fatigue. The NTSB cites this as contributing to many accidents and has conducted several research studies in order to find methods of combating fatigue in pilots. Disruption to rhythms usually has a negative effect. Many travelers have experienced the condition known as jet lag, with its associated symptoms of fatigue, disorientation, and insomnia. Studies conducted on both animals and humans show major bidirectional relationships between the circadian system and abusive drugs. It is indicated that these abusive drugs affect the central circadian pacemaker. Individuals suffering from substance abuse display disrupted rhythms. These disrupted rhythms can increase the risk for substance abuse and relapse. It is possible that genetic and/or environmental disturbances to the normal sleep and wake cycle can increase the susceptibility to addiction. It is difficult to determine if a disturbance in the circadian rhythm is at fault for an increase in prevalence for substance abuse or if other environmental factors such as stress are to blame. Changes to the circadian rhythm and sleep occur once an individual begins abusing drugs and alcohol. Once an individual chooses to stop using drugs and alcohol, the circadian rhythm continues to be disrupted. The stabilization of sleep and the circadian rhythm might possibly help to reduce the vulnerability to addiction and reduce the chances of relapse. In 2017, Jeffrey C. Hall, Michael W. Young, and Michael Rosbash were awarded Nobel Prize in Physiology or Medicine "for their discoveries of molecular mechanisms controlling the circadian rhythm". ^ a b Edgar RS, Green EW, Zhao Y, van Ooijen G, Olmedo M, Qin X, Xu Y, Pan M, Valekunja UK, Feeney KA, Maywood ES, Hastings MH, Baliga NS, Merrow M, Millar AJ, Johnson CH, Kyriacou CP, O'Neill JS, Reddy AB (May 2012). "Peroxiredoxins are conserved markers of circadian rhythms". Nature. 485 (7399): 459–64. Bibcode:2012Natur.485..459E. doi:10.1038/nature11088. PMC 3398137. PMID 22622569. ^ Vitaterna MH, Takahashi JS, Turek FW (2001). "Overview of circadian rhythms". Alcohol Research & Health. 25 (2): 85–93. PMID 11584554. ^ a b Bass J (November 2012). "Circadian topology of metabolism". Nature. 491 (7424): 348–56. Bibcode:2012Natur.491..348B. doi:10.1038/nature11704. PMID 23151577. ^ a b "The Nobel Prize in Physiology or Medicine 2017". www.nobelprize.org. Retrieved 2017-10-06. ^ Gwei-Djen Lu (25 October 2002). Celestial Lancets. Psychology Press. pp. 137–140. ISBN 978-0-7007-1458-2. ^ de Mairan JJO (1729). "Observation Botanique". Histoire de l'Academie Royale des Sciences: 35–36. ^ Gardner MJ, Hubbard KE, Hotta CT, Dodd AN, Webb AA (July 2006). "How plants tell the time". The Biochemical Journal. 397 (1): 15–24. doi:10.1042/BJ20060484. PMC 1479754. PMID 16761955. ^ Dijk DJ, von Schantz M (August 2005). "Timing and consolidation of human sleep, wakefulness, and performance by a symphony of oscillators". Journal of Biological Rhythms. 20 (4): 279–90. doi:10.1177/0748730405278292. PMID 16077148. ^ Danchin A. "Important dates 1900–1919". HKU-Pasteur Research Centre. Archived from the original on 2003-10-20. Retrieved 2008-01-12. ^ Antle MC, Silver R (November 2009). "Neural basis of timing and anticipatory behaviors". The European Journal of Neuroscience. 30 (9): 1643–9. doi:10.1111/j.1460-9568.2009.06959.x. PMC 2929840. PMID 19878281. ^ Bruce, Victor G.; Pittendrigh, Colin S. (1957). "Endogenous Rhythms in Insects and Microorganisms". The American Naturalist. 91 (858): 179–195. doi:10.1086/281977. ^ a b Pittendrigh CS (1993). "Temporal organization: reflections of a Darwinian clock-watcher". Annual Review of Physiology. 55 (1): 16–54. doi:10.1146/annurev.ph.55.030193.000313. PMID 8466172. ^ Pittendrigh CS (October 1954). "ON TEMPERATURE INDEPENDENCE IN THE CLOCK SYSTEM CONTROLLING EMERGENCE TIME IN DROSOPHILA". Proceedings of the National Academy of Sciences of the United States of America. 40 (10): 1018–29. Bibcode:1954PNAS...40.1018P. doi:10.1073/pnas.40.10.1018. PMC 534216. PMID 16589583. ^ Halberg, F. (1959). "Physiologic 24-hour periodicity: general and procedural considerations with reference to the adrenal cycle". Zeitschrift für Vitamin- Hormone- und Fermentforschung. 10: 225–296. ^ Koukkari, Willard L.; Sothern, Robert B. (2006). Introducing Biological Rhythms: A Primer on the Temporal Organization of Life, with Implications for Health, Society, Reproduction, and the Natural Environment. New York: Springer. p. 23. ISBN 978-1-4020-3691-0. ^ Halberg F, Carandente F, Cornelissen G, Katinas GS (1977). "[Glossary of chronobiology (author's transl)]". Chronobiologia. 4 Suppl 1: 1–189. PMID 352650. ^ Konopka RJ, Benzer S (September 1971). "Clock mutants of Drosophila melanogaster". Proceedings of the National Academy of Sciences of the United States of America. 68 (9): 2112–6. Bibcode:1971PNAS...68.2112K. doi:10.1073/pnas.68.9.2112. PMC 389363. PMID 5002428. ^ Reddy P, Zehring WA, Wheeler DA, Pirrotta V, Hadfield C, Hall JC, Rosbash M (October 1984). "Molecular analysis of the period locus in Drosophila melanogaster and identification of a transcript involved in biological rhythms". Cell. 38 (3): 701–10. doi:10.1016/0092-8674(84)90265-4. PMID 6435882. ^ Zehring WA, Wheeler DA, Reddy P, Konopka RJ, Kyriacou CP, Rosbash M, Hall JC (December 1984). "P-element transformation with period locus DNA restores rhythmicity to mutant, arrhythmic Drosophila melanogaster". Cell. 39 (2 Pt 1): 369–76. doi:10.1016/0092-8674(84)90015-1. PMID 6094014. ^ Bargiello TA, Jackson FR, Young MW (1984). "Restoration of circadian behavioural rhythms by gene transfer in Drosophila". Nature. 312 (5996): 752–4. Bibcode:1984Natur.312..752B. doi:10.1038/312752a0. PMID 6440029. ^ Bargiello TA, Young MW (April 1984). "Molecular genetics of a biological clock in Drosophila". Proceedings of the National Academy of Sciences of the United States of America. 81 (7): 2142–6. Bibcode:1984Natur.312..752B. doi:10.1038/312752a0. PMC 345453. PMID 16593450. ^ [unreliable medical source?] "Gene Discovered in Mice that Regulates Biological Clock". Chicago Tribune. 29 April 1994. ^ [non-primary source needed] Vitaterna MH, King DP, Chang AM, Kornhauser JM, Lowrey PL, McDonald JD, Dove WF, Pinto LH, Turek FW, Takahashi JS, et al. (April 1994). "Mutagenesis and mapping of a mouse gene, Clock, essential for circadian behavior". Science. 264 (5159): 719–25. doi:10.1126/science.8171325. PMC 3839659. PMID 8171325. ^ Debruyne JP, Noton E, Lambert CM, Maywood ES, Weaver DR, Reppert SM (May 2006). "A clock shock: mouse CLOCK is not required for circadian oscillator function". Neuron. 50 (3): 465–77. doi:10.1016/j.neuron.2006.03.041. PMID 16675400. ^ Collins B, Blau J (May 2006). "Keeping time without a clock". Neuron. 50 (3): 348–50. doi:10.1016/j.neuron.2006.04.022. PMID 16675389. ^ Johnson, Carl (2004). Chronobiology: Biological Timekeeping. Sunderland, Massachusetts, USA: Sinauer Associates, Inc. pp. 67–105. ^ Sharma VK (November 2003). "Adaptive significance of circadian clocks". Chronobiology International. 20 (6): 901–19. doi:10.1081/CBI-120026099. PMID 14680135. ^ [non-primary source needed] Sheeba V, Sharma VK, Chandrashekaran MK, Joshi A (September 1999). "Persistence of eclosion rhythm in Drosophila melanogaster after 600 generations in an aperiodic environment". Die Naturwissenschaften. 86 (9): 448–9. Bibcode:1999NW.....86..448S. doi:10.1007/s001140050651. PMID 10501695. ^ [non-primary source needed] Guyomarc'h C, Lumineau S, Richard JP (May 1998). "Circadian rhythm of activity in Japanese quail in constant darkness: variability of clarity and possibility of selection". Chronobiology International. 15 (3): 219–30. doi:10.3109/07420529808998685. PMID 9653576. ^ [non-primary source needed] Zivkovic BD, Underwood H, Steele CT, Edmonds K (October 1999). "Formal properties of the circadian and photoperiodic systems of Japanese quail: phase response curve and effects of T-cycles". Journal of Biological Rhythms. 14 (5): 378–90. doi:10.1177/074873099129000786. PMID 10511005. ^ Mori T, Johnson CH (April 2001). "Independence of circadian timing from cell division in cyanobacteria". Journal of Bacteriology. 183 (8): 2439–44. doi:10.1128/JB.183.8.2439-2444.2001. PMC 95159. PMID 11274102. ^ Hut RA, Beersma DG (July 2011). "Evolution of time-keeping mechanisms: early emergence and adaptation to photoperiod". Philosophical Transactions of the Royal Society of London. Series B, Biological Sciences. 366 (1574): 2141–54. doi:10.1098/rstb.2010.0409. PMC 3130368. PMID 21690131. ^ Dubowy C, Sehgal A (April 2017). "Drosophila melanogaster". Genetics. 205 (4): 1373–1397. doi:10.1534/genetics.115.185157. PMC 5378101. PMID 28360128. ^ [unreliable medical source?] Nagoshi E, Saini C, Bauer C, Laroche T, Naef F, Schibler U (November 2004). "Circadian gene expression in individual fibroblasts: cell-autonomous and self-sustained oscillators pass time to daughter cells". Cell. 119 (5): 693–705. doi:10.1016/j.cell.2004.11.015. PMID 15550250. ^ [non-primary source needed] Michel S, Geusz ME, Zaritsky JJ, Block GD (January 1993). "Circadian rhythm in membrane conductance expressed in isolated neurons". Science. 259 (5092): 239–41. Bibcode:1993Sci...259..239M. doi:10.1126/science.8421785. PMID 8421785. ^ Refinetti R (January 2010). "The circadian rhythm of body temperature". Frontiers in Bioscience. 15 (3): 564–94. doi:10.1016/0031-9384(92)90188-8. PMID 20036834. ^ Scheer FA, Morris CJ, Shea SA (March 2013). "The internal circadian clock increases hunger and appetite in the evening independent of food intake and other behaviors". Obesity. 21 (3): 421–3. doi:10.1002/oby.20351. PMC 3655529. PMID 23456944. ^ [unreliable medical source?] Zivkovic, Bora "Coturnix" (2007-07-25). "Clock Tutorial #16: Photoperiodism – Models and Experimental Approaches (original work from 2005-08-13)". A Blog Around the Clock. ScienceBlogs. Archived from the original on 2008-01-01. Retrieved 2007-12-09. ^ [non-primary source needed] Turek FW, Joshu C, Kohsaka A, Lin E, Ivanova G, McDearmon E, Laposky A, Losee-Olson S, Easton A, Jensen DR, Eckel RH, Takahashi JS, Bass J, et al. (May 2005). "Obesity and metabolic syndrome in circadian Clock mutant mice". Science. 308 (5724): 1043–5. Bibcode:2005Sci...308.1043T. doi:10.1126/science.1108750. PMC 3764501. PMID 15845877. ^ Delezie J, Dumont S, Dardente H, Oudart H, Gréchez-Cassiau A, Klosen P, Teboul M, Delaunay F, Pévet P, Challet E, et al. (August 2012). "The nuclear receptor REV-ERBα is required for the daily balance of carbohydrate and lipid metabolism". FASEB Journal. 26 (8): 3321–35. doi:10.1096/fj.12-208751. PMID 22562834. ^ [non-primary source needed] Delezie J, Dumont S, Dardente H, Oudart H, Gréchez-Cassiau A, Klosen P, Teboul M, Delaunay F, Pévet P, Challet E, et al. (August 2012). "The nuclear receptor REV-ERBα is required for the daily balance of carbohydrate and lipid metabolism". FASEB Journal. 26 (8): 3321–35. doi:10.1096/fj.12-208751. PMID 22562834. ^ [non-primary source needed] Scott EM, Carter AM, Grant PJ (April 2008). "Association between polymorphisms in the Clock gene, obesity and the metabolic syndrome in man". International Journal of Obesity. 32 (4): 658–62. doi:10.1038/sj.ijo.0803778. PMID 18071340. ^ [unreliable medical source?] Shneerson, J.M. ; Ohayon, M.M. ; Carskadon, M.A. (2007). "Circadian rhythms". Rapid eye movement (REM) sleep. Armenian Medical Network. Retrieved 2007-09-19. ^ "The Rhythms of Life: The Biological Clocks That Control the Daily Lives of Every Living Thing" Russell Foster & Leon Kreitzman, Publisher: Profile Books Ltd.
^ [unreliable medical source?] Regestein QR, Pavlova M (September 1995). "Treatment of delayed sleep phase syndrome". General Hospital Psychiatry. 17 (5): 335–45. doi:10.1016/0163-8343(95)00062-V. PMID 8522148. ^ [unreliable medical source?] Elizabeth Howell (14 December 2012). "Space Station to Get New Insomnia-Fighting Light Bulbs". Retrieved 2012-12-17. ^ [non-primary source needed] Spilde, Ingrid (December 2005). "Reinsdyr uten døgnrytme" (in Norwegian Bokmål). forskning.no. Archived from the original on 2007-12-03. Retrieved 2007-11-24. ...så det ikke ut til at reinen hadde noen døgnrytme om sommeren. Svalbardreinen hadde det heller ikke om vinteren. ^ Folk, G. Edgar; Thrift, Diana L.; Zimmerman, M. Bridget; Reimann, Paul (2006-12-01). "Mammalian activity – rest rhythms in Arctic continuous daylight". Biological Rhythm Research. 37 (6): 455–469. doi:10.1080/09291010600738551. Would local animals maintained under natural continuous daylight demonstrate the Aschoff effect described in previously published laboratory experiments using continuous light, in which rats' circadian activity patterns changed systematically to a longer period, expressing a 26-hour day of activity and rest? ^ [non-primary source needed] Merlin C, Gegear RJ, Reppert SM (September 2009). "Antennal circadian clocks coordinate sun compass orientation in migratory monarch butterflies". Science. 325 (5948): 1700–4. Bibcode:2009Sci...325.1700M. doi:10.1126/science.1176221. PMC 2754321. PMID 19779201. ^ [non-primary source needed] Kyriacou CP (September 2009). "Physiology. Unraveling traveling". Science. 325 (5948): 1629–30. doi:10.1126/science.1178935. PMID 19779177. ^ Silvegren G, Löfstedt C, Qi Rosén W (March 2005). "Circadian mating activity and effect of pheromone pre-exposure on pheromone response rhythms in the moth Spodoptera littoralis". Journal of Insect Physiology. 51 (3): 277–86. doi:10.1016/j.jinsphys.2004.11.013. PMID 15749110. ^ a b Webb AAR (June 2003). "The physiology of circadian rhythms in plants". New Phytologist. 160 (2): 281–303. doi:10.1046/j.1469-8137.2003.00895.x. JSTOR 1514280. ^ a b c McClung CR (April 2006). "Plant circadian rhythms". The Plant Cell. 18 (4): 792–803. doi:10.1105/tpc.106.040980. PMC 1425852. PMID 16595397. ^ Mizoguchi T, Wright L, Fujiwara S, Cremer F, Lee K, Onouchi H, Mouradov A, Fowler S, Kamada H, Putterill J, Coupland G, et al. (August 2005). "Distinct roles of GIGANTEA in promoting flowering and regulating circadian rhythms in Arabidopsis". The Plant Cell. 17 (8): 2255–70. doi:10.1105/tpc.105.033464. PMC 1182487. PMID 16006578. ^ Kolmos E, Davis SJ (September 2007). "ELF4 as a Central Gene in the Circadian Clock". Plant Signaling & Behavior. 2 (5): 370–2. doi:10.4161/psb.2.5.4463. PMC 2634215. PMID 19704602. ^ Pokhilko A, Fernández AP, Edwards KD, Southern MM, Halliday KJ, Millar AJ (March 2012). "The clock gene circuit in Arabidopsis includes a repressilator with additional feedback loops". Molecular Systems Biology. 8: 574. doi:10.1038/msb.2012.6. PMC 3321525. PMID 22395476. ^ Ma, Yuan; Gil, Sergio; Grasser, Klaus D.; Mas, Paloma (2018). "Targeted Recruitment of the Basal Transcriptional Machinery by LNK Clock Components Controls the Circadian Rhythms of Nascent RNAs in Arabidopsis". The Plant Cell. 30 (4): 907–924. doi:10.1105/tpc.18.00052. PMC 5973845. PMID 29618629. ^ Veleri S, Wülbeck C (May 2004). "Unique self-sustaining circadian oscillators within the brain of Drosophila melanogaster". Chronobiology International. 21 (3): 329–42. doi:10.1081/CBI-120038597. PMID 15332440. ^ Yoshii T, Hermann-Luibl C, Helfrich-Förster C (2015). "Circadian light-input pathways in Drosophila". Communicative & Integrative Biology. 9 (1): e1102805. doi:10.1080/19420889.2015.1102805. PMC 4802797. PMID 27066180. ^ Boothroyd CE, Young MW (2008). "The in(put)s and out(put)s of the Drosophila circadian clock". Annals of the New York Academy of Sciences. 1129 (1): 350–7. Bibcode:2008NYASA1129..350B. doi:10.1196/annals.1417.006. PMID 18591494. ^ Grima B, Lamouroux A, Chélot E, Papin C, Limbourg-Bouchon B, Rouyer F (November 2002). "The F-box protein slimb controls the levels of clock proteins period and timeless". Nature. 420 (6912): 178–82. Bibcode:2002Natur.420..178G. doi:10.1038/nature01122. PMID 12432393. ^ Ko HW, Jiang J, Edery I (December 2002). "Role for Slimb in the degradation of Drosophila Period protein phosphorylated by Doubletime". Nature. 420 (6916): 673–8. Bibcode:2002Natur.420..673K. doi:10.1038/nature01272. PMID 12442174. ^ Helfrich-Förster C (March 2005). "Neurobiology of the fruit fly's circadian clock". Genes, Brain, and Behavior. 4 (2): 65–76. doi:10.1111/j.1601-183X.2004.00092.x. PMID 15720403. ^ Lalchhandama, K. (2017). "The path to the 2017 Nobel Prize in Physiology or Medicine". Science Vision. 3 (Suppl): 1–13. ^ "Biological Clock in Mammals". BioInteractive. Howard Hughes Medical Institute. Retrieved 5 May 2015. ^ Welsh DK, Takahashi JS, Kay SA (March 2010). "Suprachiasmatic nucleus: cell autonomy and network properties". Annual Review of Physiology. 72: 551–77. doi:10.1146/annurev-physiol-021909-135919. PMC 3758475. PMID 20148688. ^ Pfeffer, M.; Korf, H.; Wicht, H. (2017). "Synchronizing effects of melatonin on diurnal and circadian rhythms". General and Comparative Endocrinology. 258: 215. ^ Kalpesh, J. "Wellness With Artificial Light". Retrieved 11 January 2016. ^ [unreliable medical source?] Scheer FA, Wright KP, Kronauer RE, Czeisler CA (August 2007). "Plasticity of the intrinsic period of the human circadian timing system". PLOS One. 2 (8): e721. Bibcode:2007PLoSO...2..721S. doi:10.1371/journal.pone.0000721. PMC 1934931. PMID 17684566. ^ [unreliable medical source?] Duffy JF, Wright KP (August 2005). "Entrainment of the human circadian system by light". Journal of Biological Rhythms. 20 (4): 326–38. doi:10.1177/0748730405277983. PMID 16077152. ^ Cromie, William (1999-07-15). "Human Biological Clock Set Back an Hour". Harvard Gazette. Retrieved 2015-07-04. ^ a b c Benloucif S, Guico MJ, Reid KJ, Wolfe LF, L'hermite-Balériaux M, Zee PC (April 2005). "Stability of melatonin and temperature as circadian phase markers and their relation to sleep times in humans". Journal of Biological Rhythms. 20 (2): 178–88. doi:10.1177/0748730404273983. PMID 15834114. ^ Adam EK, Quinn ME, Tavernier R, McQuillan MT, Dahlke KA, Gilbert KE (2017). "Diurnal cortisol slopes and mental and physical health outcomes: A systematic review and meta-analysis". Psychoneuroendocrinology. 83: 25–41. doi:10.1016/j.psyneuen.2017.05.018. PMC 5568897. PMID 28578301. ^ Baehr EK, Revelle W, Eastman CI (June 2000). "Individual differences in the phase and amplitude of the human circadian temperature rhythm: with an emphasis on morningness-eveningness". Journal of Sleep Research. 9 (2): 117–27. doi:10.1046/j.1365-2869.2000.00196.x. PMID 10849238. ^ "NHLBI Workshop: "Circadian Clock at the Interface of Lung Health and Disease" 28-29 April 2014 Executive Summary". National Heart, Lung, and Blood Institute. September 2014. Archived from the original on 2014-10-04. Retrieved 20 September 2014. ^ Cauter, Eve Van (1991). "Quantitative Analysis of the 24-Hour Blood Pressure and Heart Rate Patterns in Young Men". Hypertension. 18 (2): 199–210. doi:10.1161/01.hyp.18.2.199. PMID 1885228. ^ Quartel, Lara (2014). "The effect of the circadian rhythm of body temperature on A-level exam performance". Undergraduate Journal of Psychology. 27 (1). ^ Mohawk JA, Green CB, Takahashi JS (July 14, 2013). "Central and peripheral circadian clocks in mammals". Annual Review of Neuroscience. 35: 445–62. doi:10.1146/annurev-neuro-060909-153128. PMC 3710582. PMID 22483041. ^ Pendergast JS, Niswender KD, Yamazaki S (January 11, 2012). "Tissue-specific function of Period3 in circadian rhythmicity". PLOS One. 7 (1): e30254. Bibcode:2012PLoSO...730254P. doi:10.1371/journal.pone.0030254. PMC 3256228. PMID 22253927. ^ Maanvi Singh (10 Oct 2013). "Our Skin's Sense Of Time Helps Protect Against UV Damage". NPR. Retrieved 19 Feb 2019. ^ See, e.g., Koeffler et al., A role for the clock gene, Per1 in prostate cancer, 60 Cancer Research 7619 et seq. (Oct. 2009), at http://cancerres.aacrjournals.org/content/69/19/7619. ^ Kawara S, Mydlarski R, Mamelak AJ, Freed I, Wang B, Watanabe H, Shivji G, Tavadia SK, Suzuki H, Bjarnason GA, Jordan RC, Sauder DN (December 2002). "Low-dose ultraviolet B rays alter the mRNA expression of the circadian clock genes in cultured human keratinocytes". The Journal of Investigative Dermatology. 119 (6): 1220–3. doi:10.1046/j.1523-1747.2002.19619.x. PMID 12485420. ^ See, e.g., Schibler et al., Restricted feeding uncouples circadian oscillators in peripheral tissues from the central pacemaker in the suprachiasmatic nucleus, in 14 Genes & Development 2950–2961 (Dec. 1, 2000), at https://www.ncbi.nlm.nih.gov/pmc/articles/PMC317100/. ^ Duffy JF, Czeisler CA (June 2009). "Effect of Light on Human Circadian Physiology". Sleep Medicine Clinics. 4 (2): 165–177. doi:10.1016/j.jsmc.2009.01.004. PMC 2717723. PMID 20161220. ^ Czeisler CA, Duffy JF, Shanahan TL, Brown EN, Mitchell JF, Rimmer DW, Ronda JM, Silva EJ, Allan JS, Emens JS, Dijk DJ, Kronauer RE (June 1999). "Stability, precision, and near-24-hour period of the human circadian pacemaker". Science. 284 (5423): 2177–81. doi:10.1126/science.284.5423.2177. PMID 10381883. ^ Aldrich, Michael S. (1999). Sleep medicine. New York: Oxford University Press. ISBN 978-0-19-512957-1. ^ Wyatt, James K (1999). "Circadian temperature and melatonin rhythms, sleep, and neurobehavioral function in humans living on a 20-h day". American Journal of Physiology. 277 (4): R1152–R1163. doi:10.1152/ajpregu.1999.277.4.R1152. ^ Wright KP, Hull JT, Czeisler CA (December 2002). "Relationship between alertness, performance, and body temperature in humans". American Journal of Physiology. Regulatory, Integrative and Comparative Physiology. 283 (6): R1370–7. CiteSeerX 10.1.1.1030.9291. doi:10.1152/ajpregu.00205.2002. PMID 12388468. ^ Zhou X, Ferguson SA, Matthews RW, Sargent C, Darwent D, Kennaway DJ, Roach GD (July 2011). "Sleep, wake and phase dependent changes in neurobehavioral function under forced desynchrony". Sleep. 34 (7): 931–41. doi:10.5665/sleep.1130. PMC 3119835. PMID 21731143. Archived from the original on 2016-11-04. Retrieved 2016-11-03. ^ Kosmadopoulos A, Sargent C, Darwent D, Zhou X, Dawson D, Roach GD (December 2014). "The effects of a split sleep-wake schedule on neurobehavioural performance and predictions of performance under conditions of forced desynchrony". Chronobiology International. 31 (10): 1209–17. doi:10.3109/07420528.2014.957763. PMID 25222348. ^ Grote L, Mayer J, Penzel T, Cassel W, Krzyzanek E, Peter JH, von Wichert P (1994). "Nocturnal hypertension and cardiovascular risk: consequences for diagnosis and treatment". Journal of Cardiovascular Pharmacology. 24 Suppl 2: S26–38. PMID 7898092. ^ Hershner SD, Chervin RD (2014-06-23). "Causes and consequences of sleepiness among college students". Nature and Science of Sleep. 6: 73–84. doi:10.2147/NSS.S62907. PMC 4075951. PMID 25018659. ^ Milner CE, Cote KA (June 2009). "Benefits of napping in healthy adults: impact of nap length, time of day, age, and experience with napping". Journal of Sleep Research. 18 (2): 272–81. doi:10.1111/j.1365-2869.2008.00718.x. PMID 19645971. ^ Lovato N, Lack L (2010). The effects of napping on cognitive functioning. Progress in Brain Research. 185. pp. 155–66. doi:10.1016/B978-0-444-53702-7.00009-9. ISBN 9780444537027. PMID 21075238. ^ a b c Zelinski EL, Deibel SH, McDonald RJ (March 2014). "The trouble with circadian clock dysfunction: multiple deleterious effects on the brain and body". Neuroscience and Biobehavioral Reviews. 40 (40): 80–101. doi:10.1016/j.neubiorev.2014.01.007. PMID 24468109. ^ Sinert T, Peacock PR (10 May 2006). "Renal Failure, Acute". eMedicine from WebMD. Retrieved 2008-08-03. ^ Maung SC, El Sara A, Chapman C, Cohen D, Cukor D (May 2016). "Sleep disorders and chronic kidney disease". World Journal of Nephrology. 5 (3): 224–32. doi:10.5527/wjn.v5.i3.224. PMC 4848147. PMID 27152260. ^ Nakano S, Uchida K, Kigoshi T, Azukizawa S, Iwasaki R, Kaneko M, Morimoto S (August 1991). "Circadian rhythm of blood pressure in normotensive NIDDM subjects. Its relationship to microvascular complications". Diabetes Care. 14 (8): 707–11. doi:10.2337/diacare.14.8.707. PMID 1954805. ^ Figueiro MG, Rea MS, Bullough JD (August 2006). "Does architectural lighting contribute to breast cancer?". Journal of Carcinogenesis. 5: 20. doi:10.1186/1477-3163-5-20. PMC 1557490. PMID 16901343. ^ Rea, Mark S.; Figueiro, Mariana; Bullough, John (May 2002). "Circadian photobiology: an emerging framework for lighting practice and research". Lighting Research Technology. 34 (3): 177–187. doi:10.1191/1365782802lt057oa. ^ Walmsley L, Hanna L, Mouland J, Martial F, West A, Smedley AR, Bechtold DA, Webb AR, Lucas RJ, Brown TM (April 2015). "Colour as a signal for entraining the mammalian circadian clock". PLoS Biology. 13 (4): e1002127. doi:10.1371/journal.pbio.1002127. PMC 4401556. PMID 25884537. ^ Johnston JD (June 2014). "Physiological responses to food intake throughout the day". Nutrition Research Reviews. 27 (1): 107–18. doi:10.1017/S0954422414000055. PMC 4078443. PMID 24666537. ^ Delezie J, Challet E (December 2011). "Interactions between metabolism and circadian clocks: reciprocal disturbances". Annals of the New York Academy of Sciences. 1243 (1): 30–46. Bibcode:2011NYASA1243...30D. doi:10.1111/j.1749-6632.2011.06246.x. PMID 22211891. ^ "Jet lag disorder - Symptoms and causes". Mayo Clinic. Retrieved 2019-02-01. ^ Oritz-Tuldela E, Martinez-Nicolas A, Diaz-Mardomingo C, Garcia-Herranz S, Pereda-Perez I, Valencia A, Peraita H, Venero C, Madrid J, Rol M. 2014. The Characterization of Biological Rhythms in Mild Cognitive Impairment. BioMed Research International. ^ Hardt, Robert (1970-01-01). "The Dangers of LED-Blue light-The Suppression of Melatonin-Resulting in-Insomnia-And Cancers | Robert Hardt". Academia.edu. Retrieved 2016-12-24. ^ Bedrosian TA, Nelson RJ (January 2017). "Timing of light exposure affects mood and brain circuits". Translational Psychiatry. 7 (1): e1017. doi:10.1038/tp.2016.262. PMC 5299389. PMID 28140399. ^ a b c Logan RW, Williams WP, McClung CA (June 2014). "Circadian rhythms and addiction: mechanistic insights and future directions". Behavioral Neuroscience. 128 (3): 387–412. doi:10.1037/a0036268. PMC 4041815. PMID 24731209. ^ Prosser RA, Glass JD (June 2015). "Assessing ethanol's actions in the suprachiasmatic circadian clock using in vivo and in vitro approaches". Alcohol. 49 (4): 321–339. doi:10.1016/j.alcohol.2014.07.016. PMC 4402095. PMID 25457753. ^ Cha, Arlene Eujung (October 2, 2017). "Nobel in physiology, medicine awarded to three Americans for discovery of 'clock genes'". Washington Post. Retrieved October 2, 2017. ^ "The 2017 Nobel Prize in Physiology or Medicine – Press Release". The Nobel Foundation. October 2, 2017. Retrieved October 2, 2017. Avivi A, Albrecht U, Oster H, Joel A, Beiles A, Nevo E (November 2001). "Biological clock in total darkness: the Clock/MOP3 circadian system of the blind subterranean mole rat". Proceedings of the National Academy of Sciences of the United States of America. 98 (24): 13751–6. Bibcode:2001PNAS...9813751A. doi:10.1073/pnas.181484498. PMC 61113. PMID 11707566. Avivi A, Oster H, Joel A, Beiles A, Albrecht U, Nevo E (September 2002). "Circadian genes in a blind subterranean mammal II: conservation and uniqueness of the three Period homologs in the blind subterranean mole rat, Spalax ehrenbergi superspecies". Proceedings of the National Academy of Sciences of the United States of America. 99 (18): 11718–23. Bibcode:2002PNAS...9911718A. doi:10.1073/pnas.182423299. PMC 129335. PMID 12193657. Li D, Ma S, Guo D, Cheng T, Li H, Tian Y, Li J, Guan F, Yang B, Wang J (October 2016). "Environmental Circadian Disruption Worsens Neurologic Impairment and Inhibits Hippocampal Neurogenesis in Adult Rats After Traumatic Brain Injury". Cellular and Molecular Neurobiology. 36 (7): 1045–55. doi:10.1007/s10571-015-0295-2. PMC 4967018. PMID 26886755. Ditty JL, Williams SB, Golden SS (2003). "A cyanobacterial circadian timing mechanism". Annual Review of Genetics. 37: 513–43. doi:10.1146/annurev.genet.37.110801.142716. PMID 14616072. Dvornyk V, Vinogradova O, Nevo E (March 2003). "Origin and evolution of circadian clock genes in prokaryotes". Proceedings of the National Academy of Sciences of the United States of America. 100 (5): 2495–500. Bibcode:2003PNAS..100.2495D. doi:10.1073/pnas.0130099100. PMC 151369. PMID 12604787. Martino T, Arab S, Straume M, Belsham DD, Tata N, Cai F, Liu P, Trivieri M, Ralph M, Sole MJ (April 2004). "Day/night rhythms in gene expression of the normal murine heart". Journal of Molecular Medicine. 82 (4): 256–64. doi:10.1007/s00109-003-0520-1. PMID 14985853. Takahashi JS, Zatz M (September 1982). "Regulation of circadian rhythmicity". Science. 217 (4565): 1104–11. Bibcode:1982Sci...217.1104T. doi:10.1126/science.6287576. PMID 6287576. Tomita J, Nakajima M, Kondo T, Iwasaki H (January 2005). "No transcription-translation feedback in circadian rhythm of KaiC phosphorylation". Science. 307 (5707): 251–4. Bibcode:2005Sci...307..251T. doi:10.1126/science.1102540. PMID 15550625. Moore-Ede, Martin C.; Sulzman, Frank M.; Fuller, Charles A. (1982). The Clocks that Time Us: Physiology of the Circadian Timing System. Cambridge, Massachusetts: Harvard University Press. ISBN 978-0-674-13581-9. Wikimedia Commons has media related to Circadian rhythm. This page was last edited on 16 April 2019, at 16:40 (UTC).